The success of mole removal is highly dependent on the method that you choose to apply. You need to consult widely to determine the effects and benefits of the different available methods. There are several factors that will inform your decision including the size, location, and condition of the mole. Whichever method you choose, you should ensure that you consider your safety and consult a professional if you are in any form of doubt. 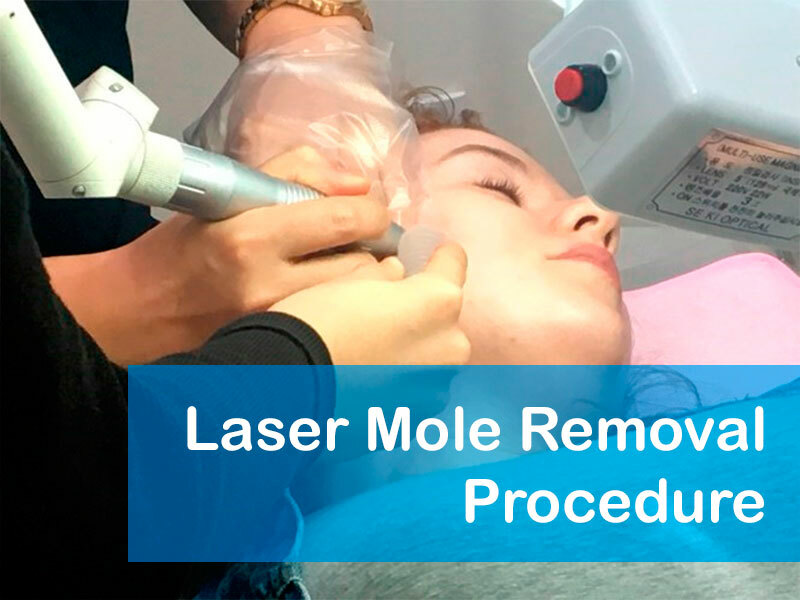 One of the mole elimination methods is the use of laser rays. While this method requires a professional, you can be sure of a blemish-free healing. We will discuss the process, cost, benefits, and limitations of the procedure in this article. Read on for more! What are the Side-Effects or Risks? 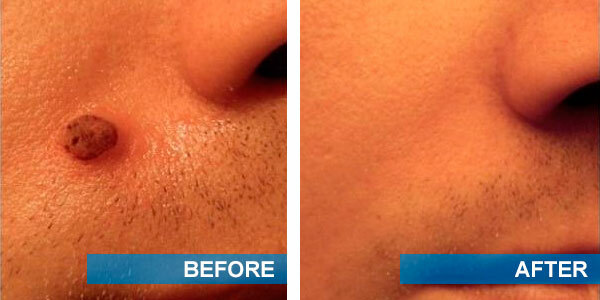 Out of the numerous mole removal methods available for use, only a few can guarantee 100% success with minimal cases of scarring. Read how to get rid of skin moles for more information. You should be careful to ensure that you select a method that is ideal for you regardless of the cost implications. In this section, we’ll discuss the efficacy of laser mole removal technique through pictures as evidence of the flawless skin obtain after the healing process. One of the greatest fears that you could be having is the pain and discomfort that may be involved in the process. Laser mole removal technique uses anesthesia and is thus pain-free! Usually, the doctor will evaluate the mole to determine any possibilities of a complication before the commencement process. This is the surest way to ensure that the entire process takes place without any preventable complications which would otherwise be costly both in terms of your health and financial resources. As you can see from this image, the picture on the left shows a mole that’s relatively large in size. The mole was subjected to laser removal technique and the picture on the right shows the healed skin. The skin, after the healing, is flawless and you can hardly tell that it had a mole in the exact position. The procedure takes approximately 30 minutes with 25 minutes used in the discussion and consent with the patient while the actual process takes 5 minutes. The time taken for the entire process is little and you’ll not feel any discomfort. In fact, you’ll be surprised when the doctor informs you that the process is complete! Immediately after the completion of the process, the affected area will start to become darker and within a few days, you will have a uniform complexion! Before the start of the procedure, professional healthcare will give a candid explanation of what to expect during and after the process. Afterward, you’ll be required to lay and the doctor will use a small needle as shown in the image above. They will repeatedly pass the needle on the mole until it completely disappears. Once the process is complete, the doctor will advise on the activities to undertake to enhance the healing process. Always ensure that you religiously follow these guidelines to guarantee flawless skin after the healing process! The cost of laser removal procedure depends on many factors. Even as you look for the most favorable price point, it is important to ensure that you do not take your focus off the main target; the quality of health care that you will receive. As such, we will combine the two expenses to get the entire mole removal cost. 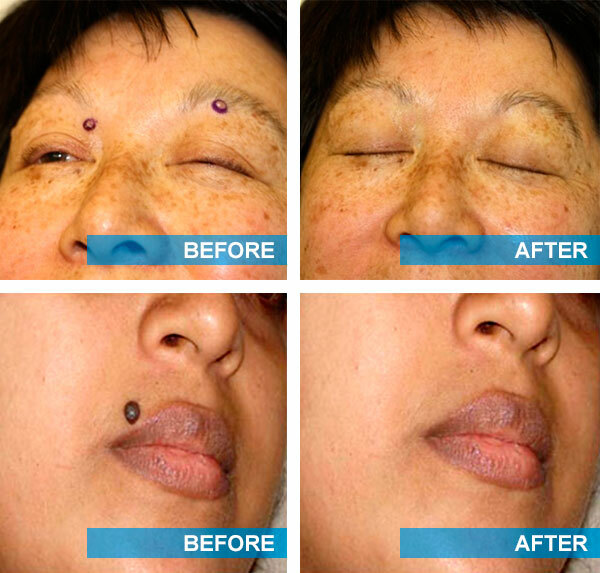 The medical expenses of removing the moles range from $50-$80 per treatment. In most facilities, the first removal process is charged higher than the subsequent treatment processes. Both before and after the treatment process, you will require to spend approximately $130 on cosmetics which may bring the total treatment cost at approximately $200. Subsequent treatments may be as low as $75. It is important to note that mole removal is covered by most insurance companies and you may not be required to pay. However, you should realize that different insurance plans will cater for different proportions of the total treatment cost. As such, you should always check with your insurance provider to determine the amount on the bill that they are willing to offset. Also, ensure that your premium contributions records are updated to prevent a scenario where you will be forced to pay the costs before the insurance company commits to paying the hospital bill. In such cases, you may be forced to pay the bill from private funds. Make a point of always having clean records will the provider and you may end up paying nothing after the completion of the procedure! After the procedure, you will require approximately 2 weeks to heal. During this period, you should ensure that you maintain high-level hygiene to prevent infections which would otherwise complicate the healing process. Nevertheless, you should note that the healing process is relatively quick compared to other removal techniques. While hygiene is critical in ensuring a quick removal process, the healing process activities are rather easy and straightforward. You should expect to experience mild irritations in the affected area. However, the discomfort will fade away within a few days. Other normal observations that you will make within the 14-day healing period include mild swelling, redness, and occasional bleeding. If you see these signs, you shouldn’t freak out because they are part of the healing process. However, all of these should occur mildly! If you realize extreme reddening, inflammation, or bleeding, you should not hesitate to consult your doctor for professional advice. After the treatment procedure, you will experience the formation of a scab on the affected part which is paramount in offering protection during the healing process. Over time, this scab will fall off naturally to allow the completion of the healing process. After the scab falls off, it is necessary to protect the skin from damage. To achieve this, ensure that you regularly apply sunscreen with a minimum SPF of 50 whenever you are working under the sun. Most importantly, ensure that you clean the sunscreen before retiring to bed to promote the integrity of the skin. The treatment site is usually dark. However, this should never be a reason to worry since it will lighten up after several days. In case you find a dent in the region from where the mole was extracted, you should relax and consider asking the doctor whether you can accelerate the process of removing the dent. Most doctors will advise you to use resurfacing lasers such as CO2 and erbium laser which will enhance the texture of the surrounding skin. Laser mole removal is a relatively quick procedure that will take a maximum of 30 minutes (25 minutes are crucial for pre-preparation techniques and 5 minutes will be utilized in the actual procedure). Evaluation. This is a critical step in the treatment process. The doctor will need to determine the ty of mole removal using laser technology. During the examination, the professional will look at the location, the size of the mole, and the state of the mole. The doctor is likely to take a biopsy sample to the lab to determine whether your mole is malignant. In case they determine malignancy, most doctors will recommend surgical excision to remove the moles on face or any other region of your skin completely. Also, moles that are too large in size are better off removed using surgical excision since it will be cheaper and requires lesser time than using laser technology. Read more about surgery options here. Preparation phase. Once the doctor determines that it is safe to carry out the procedure, they will sterilize all the equipment required in the process to prevent any cases of infections. The preparation phase will take less than one hour time. During this phase, the doctor will inform you of all the risks involved to prepare you psychologically. Anesthesia Application. The doctor will apply a local anesthesia to protect you from extreme pain. This anesthesia may come in different formulations including spray, tablets, or injections. Once the drug is administered, you will be required to relax for approximately 5 minutes to allow the spread of the drug. Laser Removal Procedure. The doctor will use specialized tools to remove the mole using a CO2 laser to excise the mole’s pigmentation which is then cleared by your body naturally. This procedure may require that you return to your doctor several times before it is entirely healed. As such, it is advisable to use other methods especially if the mole you need to remove is big. After the removal process, you have to take care of it appropriately to enhance its healing. You will achieve this by maintaining high-level hygiene throughout the procedure which will prevent any form of infection thus preventing complications. Immediately after the process, the doctor will cover the region to prevent bleeding and dirt accumulation. However, you are free to uncover the area after one day and carry out routine cleaning techniques. If the doctor recommends the use of mole removal creams, make sure that you use them religiously to accelerate the healing process. In most cases, the doctor will recommend a second visit. In such cases, you should ensure that you return for the second procedure. If you fail to honor the doctor’s instructions, it is likely that you will not succeed in eliminating the mole completely. During the treatment, the skin is exposed to intense light which can vaporize the skin. While the underlying skin is not affected, it is likely that the top layer of the skin will be scaly and dehydrated. However, this side effect is only common among people with dry skin. Another common side effect of this technique is that you may experience lighter areas on your skin as it heals. This is a problem among dark people. Among lighter people, it is common to have darker spots after the process. If you experience such, you shouldn’t worry since it will easily fade away as the spot heals. In rare cases, you may experience infections due to the vulnerability of the skin at that point. The fact that the skin is subjected to intense radiation may compromise its integrity making it highly vulnerable to infections. To avert this, you should ensure that you avoid touching the region and maintain top-notch hygiene conditions. While you may be concerned with the safety of mole removal, you shouldn’t worry since there are numerous methods that you can use to remove them safely. It is advisable that you consult a professional to recommend the best removal method. Herein, we’ve discussed laser mole removal which is ideal for you especially if your mole is neither large nor malignant. This method is effective yet cost-effective. The doctor will apply anesthesia thus eliminating the chances of suffering pain during the procedure. Also, the process is safe and the healing process quick which guarantees unmatched mole removal experience. You can find further details of Mole removal methods here.